Love ’em or hate ’em, Crocs and Uggs have undoubtedly captured the world's imagination in a way that few footwear brands have. Both offering a distinctive take on traditional footwear design, these two brands are worthy of closer comparison, such as we provide in this article. Crocs is produced by Crocs, Inc., a shoe company founded by George B. Boedecker, Jr. The company was established primarily to manufacture and distribute a foam clog that was initially designed by Foam Creations, a small company out of Quebec. Originally designed as spa footwear, Croc’s first model is called Crocs Beach, and it was released in 2002. Launched at the Ft. Lauderdale Boat Show, this model sold all 200 pairs that were produced for the initial run. Uggs or Ugg boots sheepskin boots intended for males and females. They have a twin-faced sheepskin design with fleece on the inside and a tanned outer surface combined with a sole made from synthetic materials. Ugg boots were developed in New Zealand or Australia (accounts vary), although the exact date when they were invented is unknown. 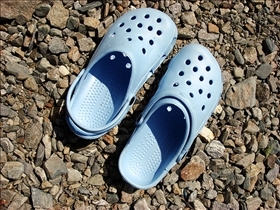 Crocs are available in a wide variety of models and several different colors. They are mainly manufactured at the Crocs facilities in Canada and Mexico, and there are contractual manufacturers in Italy, Romania, Bosnia and Herzegovina, and China as well. The Beach and Cayman models come in over 20 colors, and the other lines allow you to choose from four to six colors or two-color blends. Uggs are constructed out of sheepskins with a fleece lining. The fleece is attached to the leather during the tanning process, and the boot is assembled with the fleece inside. This allows the feet to stay dry and maintains the body temperature as well. The soles of the shoes are rubber, and the stitching is often visible on the outside. Uggs come in a wide array of colors, such as black, pink, blue, chestnut, and fuchsia. You can buy them in pull-on and lace-up designs, with height options ranging from ankle high to just above the knee. 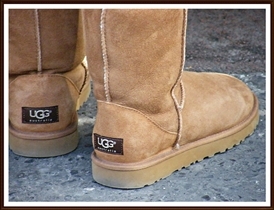 Uggs are also available in purely synthetic material, and they have been particularly popular in chain department stores. While both shoes have managed to gain immense market popularity, Crocs are far easier to find than Uggs. They are available in practically every department store, from the lowest priced to the upper mid-range outlets, even in grocery stores. And with prices ranging from $36 to $50, they are affordable to most anyone. Uggs on the other hand cost $100 and up, and they are available in far fewer outlets. This limited distribution has made Uggs a somewhat more "fashionable" and "in-demand" article than Crocs, regardless of its actual fashion appeal.